O’Neill, T., Mandak, K., Kjelgaard, M., Wilkinson, K. (2017, November). 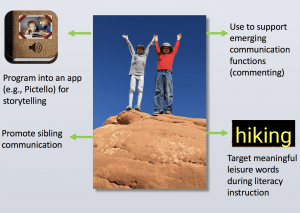 Family leisure as a context to support communication for children with ASD: Case study. Poster presentation at the Annual Conference of the American Speech-Language Hearing Association (ASHA), Los Angeles, CA. A primary role for SLPs serving children with ASD is to support families in integrating communication into highly valued family activities. Family leisure activities can provide a naturally supportive context for communication, as they provide multiple opportunities for children to interact with natural communication partners. This poster presents a case study of a family that includes a child with ASD and highlights family leisure as a context to support communication.